Susan Brownell Anthony was a prominent American civil rights leader who played a pivotal role in the 19th century women's rights movement to secure women's suffrage in the United States. She traveled the United States and Europe, and gave 75 to 100 speeches per year on women's rights for some 45 years. 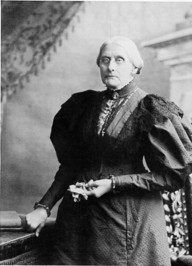 Susan B. Anthony died in Rochester, New York in her house at 17 Madison Street on March 13, 1906, and is buried at Mount Hope Cemetery.